This cookie was my shining star at the No Kid Hungry Bake Sale on October 7th, 2017! We all need a standby recipe for chocolate chip cookies. This particular recipe is the modified version of my pistachio chocolate chip recipe for smaller batches, which is excellent when I'm baking for just myself. 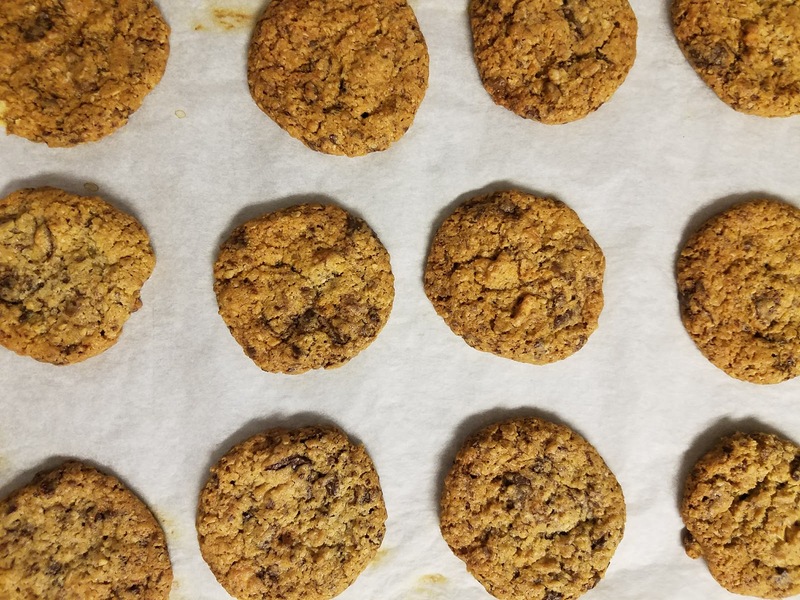 Most chocolate chip cookie recipes can be easily modified, so long as the dough remains consistent and the add-ins are accounted for properly. Baking can be art, so long as the science and chemistry of such are respected along the way. The No Kid Hungry bake sale was a total success! The bake sale itself raised over $8000 against childhood hunger in the United States. Did you know that 1 out of 5 children in the USA don't know where their next meals are going to come from? Yeah, that's pretty messed up. I work as the chef for a hunger relief network, now, and the amount of hungry people in the United States is pretty staggering, especially considering that 2 out of 3 Americans are considered overweight or obese. What we see is a huge amount of inequality, and you can do something about it. No Kid Hungry has made it easier than ever to combat childhood hunger. Did you know that you can host your own bake sale in your own community? Just sign up to host your own bake sale! I realize that I'm a very privileged individual. Yes, I'm a woman of color, and a first-generation American...but I'm also from a good family, have a stable, salaried position, have a group of good friends, have a reliable mode of transportation, and I am a homeowner. I'm also privileged enough to own nice things like standing mixers, scales, fancy equipment and marble countertops, things that the average home baker might not have. In the spirit of checking my own privilege, I'm posting the recipe below in both weight and volume, so everybody can bake these cookies, because everybody deserves to have homemade cookies. I love this recipe because you can do this one without a standing mixer and only the most rudimentary of tools. Yes, you do want either a food processor or a coffee/spice grinder for the oats, but you can honestly chop them by hand, or throw them in straight if you're feeling lazy. It's 100% cool. Melt half your butter in either a saucepot or microwave, and then pour it over the remaining butter in a separate bowl. Stir gently with a whisk to allow the temperatures to come together nicely in a smooth mass and set aside. Meanwhile, blitz the flour and rolled oats together in a food processor (or coffee grinder, if you have one) and whisk them together with the baking soda and baking powder. Take out your ritz crackers and crush them by hand ; stir them right in! Don't worry about getting the crumbs to be especially fine, because you actually want larger chunks dispersed here and there. You can also substitute potato chips for this part, and get a very similar result - I've used original flavor and jalapeno, and both are pretty freaking delicious. I know it sounds weird, but trust me on this - the salty and sweet work! Now that you've taken care of your dry ingredients, let's continue on the wet side! Whisk in both of your sugars, and add in the vanilla flavoring. Whisk-whisk-whisk until quite smooth and fluffy; yes, you can do this in a standing mixer, but the appeal of this recipe is that you feel okay skipping arm day at the gym after doing these by hand. Also, not everybody has a standing mixer or a hand mixer, so let's check our privilege, okay, Nicole? Either one of these you choose is fine; I prefer option two, just because it takes up less space in my already-crowded fridge. Also, waiting to turn on the oven to 325 degrees F will give you no choice but to chill your dough. So, hey! Turn on your oven and heat to 325 degrees F while you're waiting. Bake your cookies for 11 minutes, or until just brown on the outside, and let cool for at least 10 minutes before eating. I know, I know, it's torture, but trust me on this one - if you don't wait, this wonderful cookie will crumble and fall apart into a big gooey mess. You'll want to wait, so you can dip this in an ice-cold glass of almond-coconut milk blend. If you wait even longer, to let them cool completely, you can wrap them in groups of five in cellophane packages, instagram them with a special hashtag, and sell them for your own bake sale endeavors. It can be to end childhood hunger, to donate to the ACLU, or even to show your own child how to run a business. Please comment below if you try it - and tell me all about the results! Oh, and I'm hosting my own bake sale soon...follow me on Instagram to learn details!